In the past, it would be all too easy for left-handed golfers to feel as if they were somehow not part of the great golfing family. For many years, it was difficult to turn up at a public course and find any clubs for hire that were designed for those who play with their left. This neglect only served to dissuade a great many enthusiastic amateurs from taking up and enjoying the sport. As with many aspects of golf today, the professional game is responsible for shaping and re-shaping a great many attitudes, and in this respect it would be true to say that the right-handers are certainly not getting things their own way. Just one example of a so-called leftie is Phil Mickelson, a member of the 2006 American Ryder Cup team, whose haul of three major championships includes this year's Masters at Augusta. Despite the high profile of Mickelson, left-handers who want to get started can feel rightly neglected if they visit their local library or bookshop in search of instruction manuals that can give them some basic information about the game. Whether talking about swing, posture, grip or body alignment, any chapter will usually contain the usual cursory one line "and the opposite is true for left-handers" that makes lefties feel understandably, well, left out. One book worth consulting is On The Other Hand, written by the USPGA's only left-handed instructor, Steve Anderson, which can be found on www.anythingleft-handed.co.uk priced at £12.95 ($24.48). 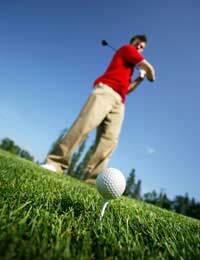 British-based players can also seek help and advice from the British Left handed Golfer Society, which is based in Bollington Cheshire (Tel: 01625 575516). Further encouragement can be gained from Terry Sims, the PGA Advanced Professional at Kingswood Golf Club in Surrey. Sims has a website at www.lefthandedgolf.co.uk which features a comprehensive range of equipment from high-profile manufacturers such as Titleist, Wilson and Callaway, to name but a few, as well as information on performance centres that cater for lefties. However, it remains the case that the majority of coaches you will encounter will be right-handed. Nevertheless, this should not preclude them from being a valuable source of instruction. Take one example: just think about how you take practice swings with companions who play the same way as yourself. Facing each other, one would be aiming in one direction, the other in the opposite direction. However, in the case of a right-handed golfer swinging opposite a leftie, they would both be swinging in the same direction, which would mean comparing and contrasting each element of the swing would be much easier. In terms of other aspects of the game, approaching technique from a left- rather than a right-handed perspective does not require tearing up the manual and starting from scratch. Coaches are always eager to help students, whichever way they swing a club, so don't be afraid of approaching them just because you happen to be a leftie. For all they know they could be helping the next Phil Mickelson take their first steps on the road to greatness, and no coach is going to turn that opportunity down.